We’d love your help. 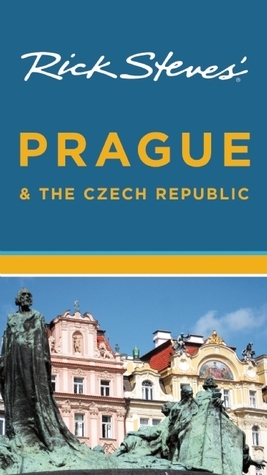 Let us know what’s wrong with this preview of Rick Steves' Prague and the Czech Republic by Rick Steves. You can count on Rick Steves to tell you what you really need to know when traveling in Prague and the Czech Republic. With this book, you'll create your own unforgettable tour of the "Golden City of a Hundred Spires." Walk across Charles Bridge at twilight, stroll the grounds of Prague Castle, and wander through the city's stunning Old Town Square. Venture beyond Prague wi You can count on Rick Steves to tell you what you really need to know when traveling in Prague and the Czech Republic. With this book, you'll create your own unforgettable tour of the "Golden City of a Hundred Spires." Walk across Charles Bridge at twilight, stroll the grounds of Prague Castle, and wander through the city's stunning Old Town Square. Venture beyond Prague with day trips to the medieval villages of Bohemia. Visit local vintners in Moravia, where you can enjoy a wine-cellar serenade. Take a dip in the peat-bog spas of Trebon—a great way to relax after a busy day of sightseeing. Rick's candid, humorous advice guides you to good-value hotels and restaurants in charming neighborhoods and villages. He gives you no-nonsense information on where to go and which sights are worth your time and money. More than just reviews and directions, a Rick Steves guidebook is a tour guide in your pocket. To ask other readers questions about Rick Steves' Prague and the Czech Republic, please sign up. Rick Steves always has good advice and we use his books whenever we visit Europe. this book was great and well worth the price we paid. Very helpful not to mention informative. Love learning and getting inspired for future trips! Very helpful for trip planning! Very informative and readable. Lots of insights into Prague and the surrounding area. I’m giving this book three stars at the moment. As it is a travel book, I reserve the right to amend my decision up or down when I make the trip. It’s a good book, written well and informative. Steves makes it accessible and enjoyable to read. How do you rank a travel book without the travel though? Very comprehensive and engaging with excellent flow and details. Feel much more attached to the history and focused on how to approach our upcoming trip to Prague. We have enjoyed following Rick as we travel throughout Europe. We plan on using his audio tours in Prague as well. Thoroughly enjoyed and appreciated on our cruise of the Danube in October. Now lent to friends. He was kind of wrong about currency exchange fees though, but that might just be that since I live in Brno not Prague, they do things differently. I would strongly suggest exchanging your currency at the exchange booths--if you are Turkish, Arab, Middle Eastern, or Italian-looking they generally do not charge you a fee to change. For me, it was cheaper to exchange currency at the booths. I got both a better exchange rate and I was not charged a fee. However, I first attempted to do what Rick Ste He was kind of wrong about currency exchange fees though, but that might just be that since I live in Brno not Prague, they do things differently. I would strongly suggest exchanging your currency at the exchange booths--if you are Turkish, Arab, Middle Eastern, or Italian-looking they generally do not charge you a fee to change. For me, it was cheaper to exchange currency at the booths. I got both a better exchange rate and I was not charged a fee. However, I first attempted to do what Rick Steves suggests in his book: change my money at the bank. The bank wanted a $5 fee and their exchange rate was lower than the exchange booth's so I felt like I would have been ripped off. Moral of the story: if you are in Brno, don't exchange your currency at the banks. I lived in Prague for about 14 months, and this book became like a friend to me. I'd visited there before living there, and I had the book then, too. I notice that one other reviewer finds Steves patronizing. I couldn't disagree more. I find him quirky, nerdy and passionate. I find his writing style engaging, and he knows how to personalize a place, and make it accessible to anybody. There are lots of great places Steves shines a spotlight on. Not just in Prague (pretty much all of his listings I lived in Prague for about 14 months, and this book became like a friend to me. I'd visited there before living there, and I had the book then, too. I notice that one other reviewer finds Steves patronizing. I couldn't disagree more. I find him quirky, nerdy and passionate. I find his writing style engaging, and he knows how to personalize a place, and make it accessible to anybody. There are lots of great places Steves shines a spotlight on. Not just in Prague (pretty much all of his listings and advice are winners), but then in the smaller towns in the country. Krumlov is a must, and so there it is. If you can go two places in the Czech Rep., Krumlov and Prague should be it. But then there's his listings in Moravia and farther east -- he whittles it down to the gems, if you're short on time. myself aggravated by Mr. Steve's arrogantly stated personal opinions. traveler to decide what they find "boring" or "worthwhile." Locals will scoff, but this book really pares the complexity of this large international city into approachable, non-scary bites. It touches on every part of town. Includes a good mini-history of the Czech Republic for the historically-challenged tourist who thinks Europe ends at Germany. Borrowed from the library to prep for a trip in the Fall. Lots of great tips and websites to venture and learn more - he also has lots of youtube vlogs and tours to watch. A good resource to start with. Rick Steves always does a great job of explaining places to the reader, good and bad. I love his shows, too. He has great tips for his readers. I love going to Europe and seeing other people walking around with his books. Typical Rick Steves guidebook. Helpful hints and explicit instructions for city walks. I never tour Europe without his help. This book wasn't as thorough as Rome or London but still an essential book for anyone traveling through Prague. I usually read Steve's travel books from cover to cover because they are so thorough and chocked full of useful information. This one was no exception. This book was a great help in deciding what was important to see on my brief trip to Prague. Rick Steve's guidebooks are my favorites! I read this in preparation for an upcoming trip to Prague and Budapest. Rick Steves guidebooks are simply the best! Not a lot of glitzy pictures, but chock-full of useful advice.